Undergraduate student Ryan Straka, from the Department of Music at UC Riverside, has composed a three-movement classical piece for a quartet based on supercomputer simulations of the impending collision between the Andromeda, Milky Way and Triangulum galaxies which will happen in 4 billion years. The project was supervised by Prof. Tim Labor (Dept. of Music, UCR), Dr. Mario De Leo and Prof. Gabriela Canalizo (Dept. of Physics and Astronomy, UCR), and was awarded funding through a National Science Foundation grant by Prof. Gillian Wilson (Dept. of Physics and Astronomy, UCR) and supported by the FIELDS Program (Prof. Bahram Mobasher, Dept. of Physics and Astronomy, UCR). The first public performance of the musical piece Galaxias: MW M31 M33 will take place on Friday, May 20th at 8 PM in the Arts Building room 166. The piece is part of a bigger program with the UCR Choral Society and UCR Chamber Music Ensembles. Tickets are free, available one hour before the concert, and given in a first-come, first-served basis. There is complimentary parking when you go to the kiosks and mention the concert. Full details of the concert here. Galaxias: MW M31 M33 is an interdisciplinary composition project bridging music and astronomy through a three-movement piece scored for clarinet, violin, cello, and piano. The inspiration for the piece was drawn from research done with simulations in supercomputers (van der Marel, 2012) on the collision of the Milky Way, Andromeda, and Triangulum spiral galaxies, which will start happening in approximately four billion years. After billions of years of interaction, a single gigantic elliptical galaxy with over a trillion stars will be the end product of this gargantuan collision. Using the astrophysical equations for the force of gravity and acceleration, which act upon each galaxy leading up to the collision, three tone rows were created and used as musical material. The first movement is purely based on sonification, a musical tool which directly uses the resulting numerical values of force and acceleration to create musical tones and rhythms. It opens with three tone rows set harmonically in the clarinet, violin, cello, and piano. The rows are played without factoring in rhythm at first, and then played in canon halfway through the piece, followed by being played independently in the piano. The second movement represents the composer’s artistic interpretation of the chaotic collision between the galaxies. The rows based on the equations are used here again, as musical and thematic material. The final movement ponders upon the beauty of the vast wonders of space, as imagined by the composer. The opening motif in the piano is reminiscent of Debussy’s Nuages, two chords that plane back and forth providing a harmonic basis for the composition. The middle of the third movement features a melody that is presented in its original, inverted, and retrograde position, as well as sequenced from another position of the scale. 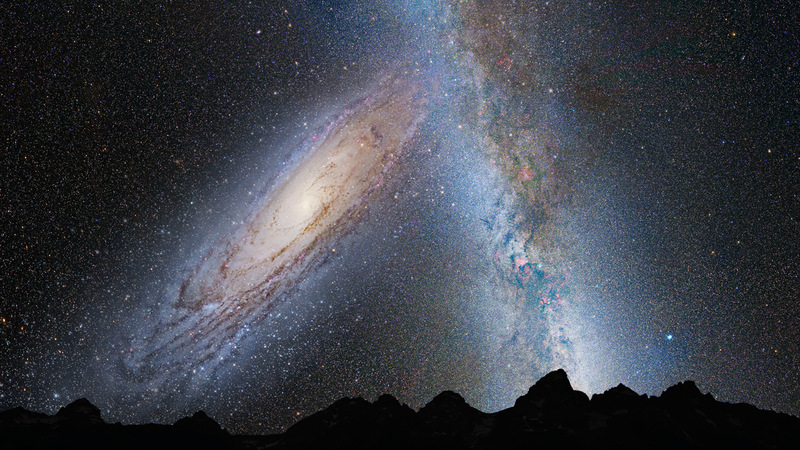 Image: Artist’s rendition of the beginning of the collision between Andromeda (left) and the Milky Way (right) galaxies as seen from Earth in four billion years time. Credit: NASA.